I debated where to start. What category, just one? It became an obstacle. 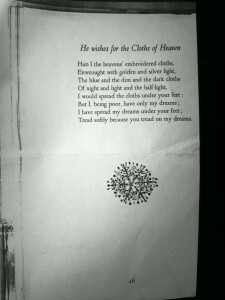 And then, in an old box I found this poem by William Henry Yeats. I was going to type it but the 1994 library copy is too good to miss. This Poem is from his book “Aedh Wishes for the Cloths of Heaven” It was published in 1899 in his third volume of poetry, The Wind Among the Reeds. There is so much more to this poem, as I myself learned yesterday. I guess I was realizing how much these words have influenced others. Please , all I ask is to remember dear reader, and hopefully new friend, we are all treading on each others dreams. Please tread softly. This world needs as much empathy as we can muster. May this blog evolve and grow into a sanctuary where we can heal, share, comfort, and nurture one another.